Lisa Jones-Engel, CSDE Affiliate and UW Affiliate Associate Professor of Anthropology, and Amy Klegarth, a Postdoctoral Research Associate in Anthropology at UW, recently published a study on the ranging patterns of urban primates. 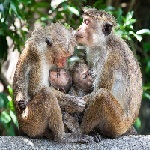 The team placed GPS collars on two species of macaques in order to better understand how urbanization has affected mobility in Singapore and Gibraltar. The study’s findings highlight how macaques’ behavioral plasticity is represented in their ranging patterns and preferences. You can read the full study below.